Nothing says “American cuisine” like a big juicy hamburger. Sure…it may have been named after the Hamburg Steak of Hamburg, Germany. But there’s no doubt that real burgers are the definitive dinner of the Land of the Free and the Home of the Brave. The city of Seymour, Wisconsin is one of several places in the U.S. that lays claim to being the birthplace of the original burger. The story of Hamburger Charlie’s big idea at the Outagamie County Fair is a tribute to American ingenuity and the spirit of entrepreneurship. Every summer, Seymour holds a huge bash to celebrate hamburgers and their history in Wisconsin. But the rest of the year – it’s a different story. As the story goes, a 15-year-old Charles Nagreen went to the Outagamie County Fair in 1885 riding a wagon pulled by a yolk of oxen. His plan was to make some money selling homemade meatballs to the crowd. But he soon realized there was a big problem. Folks at the fair wanted to keep walking around. Eating a meatball at the same time ended up making quite a mess. That’s when the young businessman experienced what very well may have been a historic epiphany. Young Charlie realized it would be much easier for people to eat his meatballs if he smashed them between two slices of bread. Nagreen himself claimed to have given the sandwich the name – hamburger. According to accounts from HomeoftheHamburger.com, Nagreen was the one to name it after the Hamburg steak (a type of ground beefsteak) because it would be recognizable to the many German immigrants living in the area. Hamburger Charlie, as Nagreen became known, was a colorful character remembered for being an effective promoter as well. An interview with former employee Emil Wurm tells of how Nagreen would play music, sing, and tell jokes to draw a crowd on slow days. Nagreen also owned an ice cream shop in Appleton and took his hamburgers as well as other concessions to fairs all over Northeast Wisconsin. There are several other tales that claim to explain the burger’s beginnings. Here’s a quick look at HamburgerCharlie’s competition. Did the Hamburger actually come out of Hamburg, New York? The city of Hamburg, New York says it did – surprise, surprise. Much like Seymour, Hamburg holds a BurgerFest every summer. Folks there claim that the Menches Brothers came from Ohio to sell food at the Erie County Fair in 1885 and ran out of pork sausage. So they went to a local butcher who gave them ground beef. Frank and Charles Menches seasoned the meat with coffee and brown sugar, and they named the sandwich after the town. You can still visit Menches Bros. restaurant in Akron, Ohio. They also claim to have invented the ice cream cone and the idea for Cracker Jacks. 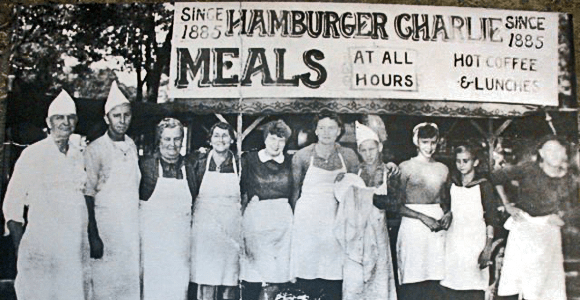 Another hamburger origin story comes from a little lunch place on the East Coast. In this tale, the hamburger was born out of convenience – quite literally the need for fast food. In 1900, a man came into Louis’ Lunch in a big hurry and asked owner Louis Lassen for something he could eat on the go. Louis grilled up some steak trimmings, put it in between two pieces of toast and sent the happy customer out the door. Deep in the heart of Texas is yet another birth of the burger story. Fletcher Davis – better known as Old Dave or Uncle Fletch – allegedly began making a burger-like sandwich in the mid-1880s. But it was at the 1904 World’s Fair in St. Louis Missouri that he made it famous. Apparently, there is significant documentation supporting this story. A very interesting 2009 article from Texas Monthly points out that the New York Tribune made mention of a sandwich called the hamburger at the 1904 World’s Fair – but it doesn’t mention the vendor’s name. The Athens, Texas theory is supported by McDonald’s and Dairy Queen. But the article from Texas Monthly raises plenty of questions about its truth as does an LA Times article with the headline “Want Lies With That?” It was written when the Texas Legislature tired to declare the Lone Star State – Home of the Hamburger. Finally – there is Weber’s in Tulsa. I’ve actually had these burgers – which are okay – but their root beer is phenomenal. This story has the hamburger created at a Fourth of July picnic in 1891. Oscar “Weber” Bilby built his own grill and served up dozens of ground beef burgers on his wife’s sourdough buns along with his superior soda. The meal was such a hit, it turned into a summer holiday tradition for the community. This story is unique because it’s the only one that has the original burger on a bun instead of bread or toast. Apparently, travel writer Michael Wallis proclaimed Weber’s to be the birthplace of the burger as we know it in his book, Route 66: The Mother Road. But the Bilby family didn’t open a restaurant until 1933. By that time – burgers were being eaten everywhere. They Can’t All Be True…Or Can They? You’ll notice there is a lot in common among the five big stories of the hamburger’s birth. All of them took place within a time-span of 20 years – between 1885 and 1904. All except for Louis’ Lunch happened at fairs or big summer events – places where ideas could spread. In many cases the burger was born out of need for convenience – like portability and speed. It’s quite possible that there is truth to all of these hamburger histories. Perhaps the fact that all these accounts occurred around the turn of the century is more than just a coincidence. It was a time following the Industrial Revolution. More people were working in factories and living in cities. Sandwiches quickly became a popular food – because they’re a cheap, quick meal that’s easy to eat. The 1890s were also a decade when new ideas and innovations were popping up all over the place. So it makes sense that Americans were whipping up new kinds of sandwiches to serve a hungry public. It’s not too much of a stretch to believe that all of these men could have come up with similarly novel – yet quite simple idea around the same time. We’re talking about putting a hunk of meat in between some bread. It’s a burger – not brain surgery. What’s Missing in Seymour Today? Hamburger Charlie’s story is fantastic. It’s convincing because we got the story straight from his mouth – not secondhand from family members who may be stretching the truth. It’s also the earliest date of any of the other claims. This is a wonderful tradition that should be remembered and celebrated. But can you really do that in Northeast Wisconsin? Yes – and no. The annual Home of the Hamburger Festival in Seymour is a lot of fun. However, where can you go in Seymour and have a Hamburger Charlie style burger? Nowhere. Do we even really know what a burger from Hamburger Charlie would taste like? What was his recipe? How did he make them? You can have a burger grilled in tradition at Louis’ Lunch in Connecticut. You can visit the Menches Brother’s restaurant in Ohio or feast on a burger, fries and root beer at Weber’s in Oklahoma. Sadly…there is no place in Wisconsin that serves up a traditional Hamburger Charlie sandwich. Sure, you can visit the small museum of hamburger memorabilia in Seymour, and see the statue of Charles Nagreen. But it just doesn’t seem right that Charlie’s burgers didn’t live on – along with his legend. This isn’t just a travesty. This is an opportunity. The right small business owner, chef or restauranteur has the chance to bring Hamburger Charlie’s legacy back to life. Instead of a couple days each summer – Seymour (or some place in Northeast Wisconsin) could be a destination for burger lovers and foodies from all over the country. After all – those people are actually expecting to find something like that when they come to our area. Check out this thread from RoadFood.com. Tourists came to Seymour during the festival looking for a place to eat an amazing burger. They didn’t find it. Interestingly – that same forum lists a possible recipe for a Hamburger Charlie style burger. Is This Hamburger Charlie’s Recipe? In keeping with Mr Nagreen’s original formula, this hamburger is a double patty with an onion in the middle. WhooNEW tried contacting the curators of the Home of the Hamburger website to ask multiple questions – including whether this recipe is legit. But only an email address is left for contact information, and all emails bounced back to us. Do you agree that Northeast Wisconsin needs to honor this local hero with a restaurant that pays tribute to Hamburger Charlie? Do you know anything about his original recipe? Are his family members still living in the area? Plus, don’t forget to Like WhooNEW on Facebook so you can check out all of our other Wisconsin stories! Note: After this story was published a reader emailed us to say there is at least one place that sells burgers dedicated to Hamburger Charlie in Seymour – that’s the Jackson Point Sports Grill at Crystal Springs Golf Course. I enjoy your comments so very much on all your posts. I will have a much better vacation on Washington Island in August because of your column. I reposted the hamburger story and hope that someone from my hometown will step up and take your challenge. I live in Dallas now and hate having to argue with Texans who think Athens is the home of the hamburger. Keep up the excellent info for enjoying the great state of WI. Thank you very much, Mary! Of course, we can’t blame those Texans for sticking with their own story. Texans are loyal to their home state just like Wisconsinites. Stay strong down there and have fun up in Door Co. next month. Thanks for the great story Kasey. I always thought McDonalds had something to do with the creation of the burger. I’m a vegetarian but the Seymour festival sounds like a great event. You can easily find the BEST burger in Wisconsin… It’s at Al’s in downtown Green Bay. Al’s is definitely a legendary place! Great breakfast too. Thanks for stopping by, Ed. Sorry. CT has that honor. I live in the town next to Seymour, but I go to school and work in Seymour. There are no burger places here besides McDonalds. Someone needs to make a Bob’s Burger here, but instead call it Charlie’s Burger. Haha.